What we think, what we feel emotionally, and our state of health are not separate issues but are inseparably related. When thoughts are continually negative we experience unpleasant emotions, thereby altering the neurochemistry that controls our physiology. As a result we gradually develop physical symptoms that become steadily more disturbing. Also, for some individuals, certain emotions can be way too sensitive. In other words, the emotions are out of proportion to the events which trigger them. This will bring about the constant negative thoughts and subsequent physical illness. Of course there are those individuals who will, in fact, have to live with an untreatable illness, but their greatest suffering is often generated by the accompanying unpleasant emotions, and thoughts that refuse to go away. Fortunately, when significant change takes place in any one of these three elements (thoughts, emotions, and physical symptoms), the other two normally improve as well. 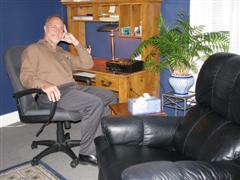 I use hypnosis to improve the emotional component and to facilitate positive thinking. If your primary concern is a medical or psychiatric problem, the American Medical Association and numerous scientific investigators have acknowledged the unique and effective usefulness of hypnosis. Nonetheless, you should always seek help from a licensed medical practitioner first.